When you experience a hand injury or arthritis in your hands, simple motions like pointing or curling the fingers can be difficult. Regular exercises to strengthen the muscles in the fingers can improve range of motion and reduce pain in the finger joints. One method to increase the intensity of these exercises is use of strong rubber bands wrapped around the hand. The rubber band can help your fingers move as one or create resistance to strengthen your hand muscles. 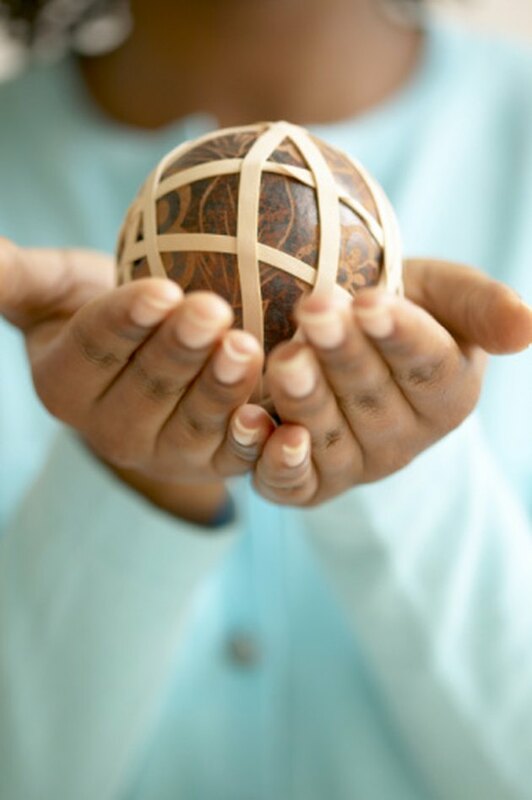 Use a wide, strong rubber band that will fit securely around your fingers. Place the band over your fingers at your knuckles. Resist against the band to expand your fingers, stretching them out as far as you possibly can. Do not, however, stretch them to the point of pain. Hold this position for three to five seconds, then slowly control the fingers in as you return to your starting position. Repeat throughout the day, first performing at least 50 repetitions. As your fingers become stronger, you should work your way up to performing 200 repetitions. Wrap a wide rubber band around your hand and stretch your fingers out with your hand lying flat on a table. Resist against the rubber band to lift your pinkie finger. Hold the finger in the air for three to five seconds. Repeat with each finger, including your thumb. Now go in the opposite direction, beginning with the thumb and working your way over to your pinkie. Repeat on the opposite hand, then rest your hands. With the wide rubber band wrapped around your fingers, gently bend your wrist backward toward your body. With your opposite hand, grab the rubber band and use it to pull your hand back farther, deepening the stretch. Hold this position for five seconds, then release the stretch. Repeat this exercise 10 times, then perform on the opposite side. Complete the exercise by performing two additional sets with each hand. Place the wide rubber band across the top of your four fingers. Hold your hand in the air with your fingers straight. Bend your fingers at your middle joints to bring the fingertips toward your palm. Maintain this position as you open the fingers slightly, stretching the spaces between each finger. Move your fingers back together and lift your fingers to return your hand to your starting position. Repeat 10 times on this hand and then perform on the opposite hand.